I’m the type of person who will eat most any food put in front of me. If I haven’t tried it, I’ll give it a taste, even if it looks like a cucumber-shaped, slimy mold or comes from an unusual body part. Just don’t put fruit snacks in front of me. I never could quite bond with my peers over those gummies. I like to invite people over for dinner whenever possible. Before the big meal, I like to check whether or not my guests eat meat, dairy, or seafood, most importantly out of courtesy to any particular spiritual or philosophical leanings in their lifestyle. Unless otherwise warned, the rest of the palate is fair game! Certainly, everyone has their own personal preferences. My dad, for example, likes tomatoes best if they are cut into small pieces and cooked. My girlfriend will eat any kind of onion always, but likes them best when diced up into teeny-tiny bits. As food reactions surface at these dinners, I tuck them away in my thoughts. What I began to notice was that one food in particular consistently produced immediate and definite reactions of the emotional kind: mushrooms. Let’s face it, mushrooms don’t exactly advocate for themselves, aesthetically speaking. They tend to have a pungent smell, look like something that would be served next to mystery meat at your local hospital, and often grow amongst decomposing matter in a soggy woodland. Mushrooms wouldn’t get an interview with me from that resume! But I was curious: Why was it mushrooms (whose name we’ve heard from since we were young as mainly a pizza topping and not one of these hip, tongue-twisting names like quinoa or freekah) that produced fear in the eyes of many a fork-holder? This mushroom conundrum first came up for me this past October when I found myself in possession of 30+lbs of Hen of the Woods, or maitake mushrooms, in Hartford’s own Keney Park. If you ask me nicely, I might tell you where to look next year. Maitake is a Japanese word meaning “dancing mushroom.” The folklore behind the name comes from ancient times when maitake were a rare but well-revered commodity among rural people. When they found clusters of the sacred mushroom, people were said to have danced around with joy. The mushroom’s Latin name, Grifola fondosa, comes in reference to the heroic mythical griffin. Along with shitake and enoki mushrooms, maitake are some of the most common fungi used in Japanese cuisine. These mushrooms, foraged from the base of oak trees September – October, have been used for centuries in Eastern medicine. Maitake are high in polysaccharides which boost immunity and lower cholesterol levels. 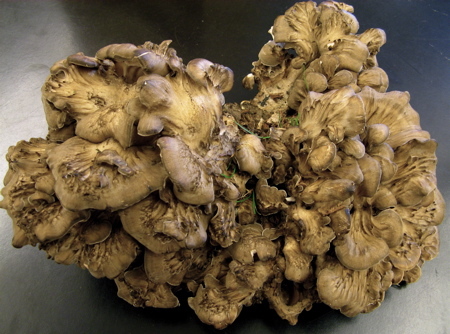 Recent research at Sloan-Kettering in maitake’s high antioxidant levels and ability to enhance populations of interleukins and lymphokines, has encouraged doctors to investigate the supplementary use of maitake with cancer patients. Maitake are best when either cut in thin slices and sautéed in butter or dried and steeped as a rich tea. You generally only eat the caps, since the stems are pretty tough. Unlike most vegetables or fruits, very few gardeners or farmers I know are versed in how to grow their own mushrooms. When it comes to both soil and human health, fungi possess beneficial characteristics that we would do well to integrate with our agrarian habits. Hence, the birth of the Mushroom Mysterium project, in which I aim to unravel some of the mystery surrounding mycelium (see what I did there?) and other such components of these powerful beings. I will document my own experience in growing oyster mushrooms for the first time, as well as poke around at the question of why we should care about fungal health in our environment. Bonus! I have also arranged for a Gourmet Mushroom Cultivation workshop to be held at KNOX (75 Laurel Street in Hartford) on Saturday, June 11th from 10:30 am to noon. Joel Weik, a local mushroom aficionado, will be leading the workshop. What are your experiences growing or foraging for mushrooms? Share here and let’s get the fungal conversation sporing!